The first poster for 2018's The Grinch is here. We've known about this movie for a long time, but details on this holiday classic retake have been pretty scarce. 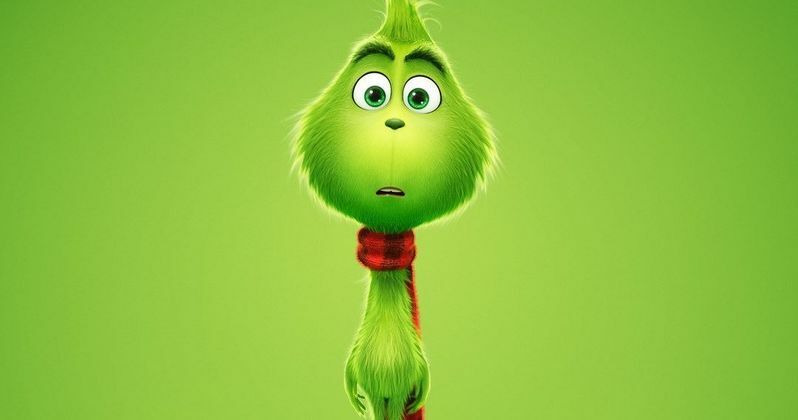 However, with this year's holiday season in full swing, the folks at Illumination Entertainment and Universal have finally given us a little something to chew on in the form of the first poster for The Grinch. Surprisingly, he's looking pretty tame, but they warn that it won't last. "He gets meaner. See #TheGrinch in theaters Holiday 2018." The Grinch tells the story of a green, grumpy figure who goes on a mission to steal Christmas, only to have his heart changed by a young girl's generous holiday spirit. This heartwarming tale about the spirit of Christmas is beloved as a Dr. Seuss story, but really became a holiday staple when it was presented in animated form in How the Grinch Stole Christmas. In this latest version, Oscar nominee Benedict Cumberbatch (Doctor Strange) lends his voice to the infamous character, who lives a solitary life inside a cave atop Mt. Crumpet with only his loyal dog, Max, to keep him company. The character was also brought to life in a live-action movie from director Ron Howard in 2000 that features Jim Carrey in the lead role. Despite the arrival of this first poster, we still don't know too much about The Grinch, other than the title, which doesn't take on the full title of the book it's based on. Though, this poster does indicate that we're going to delve into uncharted territory here, as we're going to explore the teen year's of this grumpy holiday detractor. Illumination Entertainment isn't a stranger to the world of Dr. Seuss. In 2012, they adapted The Lorax, which was moderately successful. However, in the years since, Illumination has become a powerhouse animations studio, with hits like Despicable Me 2, Despicable Me 3, The Secret Life of Pets and Sing to their name. So the studio has grown a lot in that time and, with a guy like Benedict Cumberbatch perfectly cast as the titular character, this may be a remake worth watching. Though, we should probably at least wait for a trailer before fully declaring that. The Grinch is currently set for release on November 9, 2018. With the arrival of this new poster, it's possible we could see a very brief teaser of some kind before year's end to fit in with the Christmas season. That's just a guess, but it's not too hard to imagine the studio could have something to show us, since they've been working on this movie for a long time. While we wait for some actual footage, be sure to check out the new poster for The Grinch for yourself below.